As an update and TRAC's ongoing coverage of this issue, on 21 January 2019, ELN claimed credit. Authorities believe the bombing took 6 months to plan and established that the device was detonated remotely, most probably by cellphone. It was also revealed that United States military personnel were inside the academy training Colombian cadets at the time of the explosion. A man identified as Ricardo Andrés Carvajal Salgar has confessed to participating in the bombing. The attack does not resemble the bomb construction of the last bombing in Bogotá in June 2017 that remains unclaimed. This bomb was much more sophisticated with 80 kilos of pentolite explosives. Though no group has claimed the attack, authorities have linked the remains inside the vehicle to a notorious ELN bomb maker Macho Kiko. Recent ELN attacks have been restricted to small IEDs on Caño Limón - Coveñas pipeline. 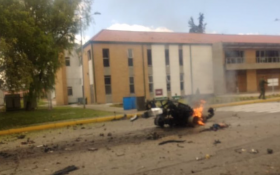 On the morning of 17 January 2019, a 1993 Nissan plowed through main gates of the General Santander academy, taking advantage of authorized motorcycles that were leaving at the time outside in southern Bogotá, Colombia. The vehicle was packed with 80 kilos of pentolite explosives. The remains of the body found in the vehicle were identified as José Aldemar Rojas, who police believe was secretly Mocho Kiko. Kiko is the notorious one armed bomb maker for the Ejercito de Liberacion Nacional (ELN) who lost his arm making bombs with a ELN cell near the border with Venezuela. The current casualty toll is at 21 dead and 70 wounded.